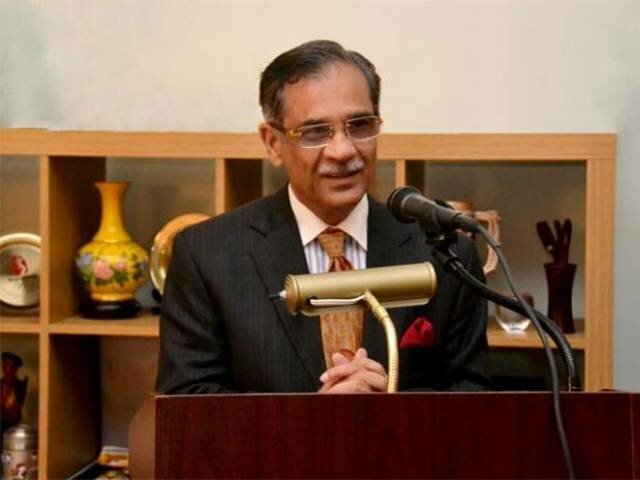 ISLAMABAD: Chief Justice of Pakistan (CJP) Mian Saqib Nisar Wednesday said that those opposing the construction of dams were “working on somebody else’s agenda” and vowed that agenda of such people would be foiled. Justice Nisar said this while heading a three-judge bench in a case pertaining to allocation of land for the construction of Dadhocha dam. “The people who are against the construction of dams in Pakistan are pursuing someone else’s agenda,” Justice Nisar said, vowing that the dams would be built under all circumstances. “Construction of dams is a matter of fundamental rights,” the top judge stated in reference to remarks passed by a scientist that the Supreme Court should form its own political party. “There is no need for anyone to say this,” he said. The CJP said that dams were being constructed for Pakistan’s future generations, stressing that there will be no compromise on it regardless of who criticises it. The chief justice also said that any illegal activity will not be allowed under the guise of dam fund, adding that the name of the Diamer-Bhasha and Mohmand Dam fund will not be changed. The top-judge informed that the dam fund account owned by the Supreme Court and nobody can steal any money from it. He went onto say that no one can stop the construction of the dam because younger generations have become involved in it. “I am the guardian of dam fund as long as I am here,” the CJP remarked. In 2006, the Defence Housing Authority (DHA) had purchased 18,000-kanal land at the site where the Dadhocha dam was to be built and launched a housing scheme as a joint venture with Bahria Town. The DHA Valley scheme, meant for the bereaved families of martyred military personnel, was proposed as the dam site. On August 4, 2015, the SC in a suo motu case directed the Punjab government to construct the dam at the originally proposed site. Soon after these directives, the government banned the sale and purchase of land in the area and allocated funds for the construction of the dam in its annual development plan for 2017-18. On the SC’ directives, the Punjab government in 2017 initiated the process to construct the dam at a cost of Rs7 billion to overcome the water shortage in Rawalpindi. In Tuesday’s hearing, the court asked the housing scheme to submit its recommendations to the Punjab government for the matter and asked the Punjab government to examine the venture. Moreover, the court asked the Punjab government to inform the court about the duration of a dam’s completion and the cost incurred during its construction. Punjab irrigation secretary told the court that the provincial government had allocated funds for the acquisition of land for the dam. He added that the housing scheme was proposed on an 11,000-kanal site. Subsequently, Justice Nisar asked what obstacles the Punjab government was facing in the construction of the dam by Bahria Town. “I know that commission mafia’s commission will be cut and this is the obstacle,” he remarked, stressing that he won’t let anyone take any cuts or commission. The top judge said that the commission mafia should fear God and that the dam project was under strain because of this commission mafia. He asked them, without naming them, to think about themselves, the country and the future of its citizens. Justice Nisar responded that the construction of the dam is a national cause and they would need to come together for it. He told the secretary that he should be giving money instead of taking money, to which the secretary responded that he had already contributed money to the dam fund. The hearing was postponed until next week.